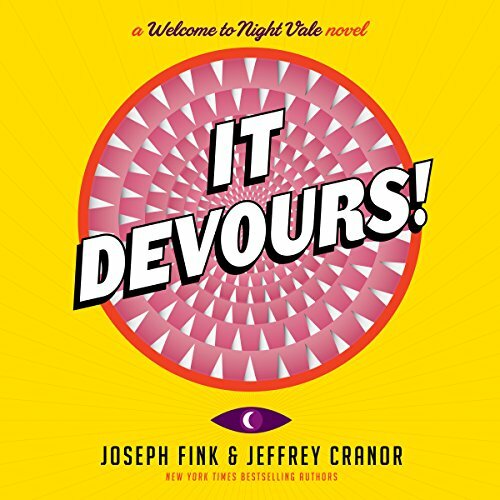 From the authors of the New York Times best-selling novel Welcome to Night Vale and the creators of the international podcast of the same name comes a mystery exploring the intersections of faith and science, the growing relationship between two young people who want desperately to trust each other, and the terrifying, toothy power of the Smiling God. Nilanjana Sikdar is an outsider to the town of Night Vale. Working for Carlos, the town's top scientist, she relies on fact and logic as her guiding principles. But all of that is put into question when Carlos gives her a special assignment investigating a mysterious rumbling in the desert wasteland outside of town. This investigation leads her to the Joyous Congregation of the Smiling God and to Darryl, one of its most committed members. Caught between her beliefs in the ultimate power of science and her growing attraction to Darryl, she begins to suspect the Congregation is planning a ritual that could threaten the lives of everyone in town. Nilanjana and Darryl must search for common ground between their very different worldviews as they are faced with the congregation's darkest and most terrible secret. i feel miserable giving a WtNV product bad review. Story is excellent but buried under situational rubble that doesn't advance worldbuilding, plot or character. I did manage to finish it. And now I know more about nightvale's lore. That makes the purchase worth it in my eyes. Just... Be ready to a lot of filler, ok? Voice is perfection itself as always. The book is just okay. The story is entertaining, but doesn't really hold my attention. The writers and Cecil and the rest of the cast do an amazing job with the podcast, but for some reason it doesn't quite hold up in book format. That being said, I did enjoy hearing more about the scientists and Josh updates and the Church of the Smiling God. It started off with the familiar feel of Night Vale and I enjoyed it in the beginning but as the story progressed the characters just felt less and less like they had been already developed in the series and that felt the same way with the town. It just felt changed and it ended up feeling like a more so normal town than the town I love that is Night Vale. Jeffrey and Joseph hit it out of the park again by delivering a fun and interesting story! Diverse, thoughtful, and just plain hilarious! And of course, Cecil’s performance is impeccable! His voice always puts my heart to rest. Love it! Cecil was great as always and the plot tied nicely, this is a vastly improved sophomore performance! Characters were easy to keep track of, old and new, and had many of the unique quirks you would expect of this small desert town. I was excited for this to come out and it was worth the wait. I listened to it completely in 1 day. I really enjoy WTNV the first book and the podcast so when I heard they had a second book coming out I pre-ordered it immediately. But unlike the first book which was rich with complex characters and character development and offered greater insight into the world of WTNV, this book was just so forced and one-dimensional with its characters and plot. It's like the creators took the WTNV twitter feed, picked out their most famous quotes and tried to make a book around great one liners. No characters could be summed up as CW drama TV-show tropes. You have a spunky protagonist who isn't from around the area and thus doesn't follow the rules. You have the love interest who's essentially the puppy dog that always means well even if he's doing something bad. You have a church filled with corrupt leaders and misconstruing the religion. You have the mentor who is hard set in his ways and will stop at nothing to save the ones he loves. And you have a common problem/enemy that loosely ties the story together. I was beyond disappointed and had to force myself to listen to the end. This is not WTNV's best work and if this is your first exposure to the series, I suggest going and listening/reading the first book Welcome to Night Vale. If you're a long time WTNV fan I highly suggest skipping this work. It is just disappointingly bad. There is no subtlety or depth to this book. It's just tropes mixed with a simple and predictable plot layered with blatant didactic messages of "science and religions are not inherently good or bad they're just tools for how to approach life. And if someone is using that tool for bad ulterior motives it is up to you to stand up to them". While everything about the story is bad, I still have to give props to the narration and performance of the text. Cecil's narration is the only decent thing about this book. The storyline is so bizarre, twisted, and strange in its own world. Like if the writeres of the twilight zone smoked acid. The thumbs up. I love Night Vale. The world, the characters, Cecil's voice, the world government, the whole thing. This book is a wonderfull extension of that universe. Cecil is great as always, maybe even better than usual and the story is as you would expect of night vale.